Effectively remove airborne lint generated during knitting or spinning of cotton yarns. Save money due to reduce plant cleaning frequency. Reduce air filter changes in heating and cooling systems. Save maintenance time with durable, easy-to-clean, perforated metal screen filters as standard equipment. Provide a cleaner working environment for employees. Quiet operation is below OSHA noise level standards. The Hanging Lint Vacuum saves space by freeing up valuable floor areas. The Alandale Bumblebee II is an effective and inexpensive method of reducing lint. Our most compact and inexpensive system is easily suspended from the ceiling, requiring no valuable floor space. Lint is extracted from the air and collected with an easy-to-clean filter bag. Less contamination from machine to machine. Fewer machine stops caused by lint-associated problems. Improved working conditions since your plant stays cleaner. Most of the lint in the air is removed, providing a safer, cleaner, and more comfortable working environment for your employees. The Slim Vac’s profile makes it ideal for tight spaces, since it is only 18 inches deep and 48 inches wide. Particularly effective when used with Alandale’s Isolator Rooms. Comes with a durable, perforated metal screen filter for maintenance free cleaning. Available with metal filter screens on one or both sides of the vacuum. Provides a cleaner environment for plant personnel. 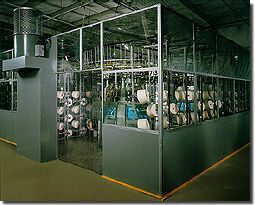 Eliminates cross contamination of yarn types and colors between machines. Pre-fabricated sections in 3-foot and 4-foot sizes fit together quickly and easily. Allows for various configurations that can be arranged to fit around all knitting, weaving or spinning machines and related support equipment. Eliminates the need to clean machines and support equipment when not in use.